To steer Maurycy Gottlieb's "Jesus Before his Judges" out of the little apartment on George Eliot Street in Tel Aviv and into the waiting van below, the three movers from the Israel Museum maneuvered around corners, through doorways and down stairs, their firm grip on the frame of the 2.80-3 x 1.70-meter canvas its only ballast against the wind that threatened to carry away the painting like a sail. 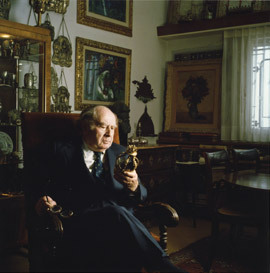 As the objects were removed one by one from the apartment, the walls, newly denuded of Hanukkah lamps and decorative marriage contracts (ketubbot), seemed to recede, altering the dimensions of the small, crowded home where Pnina and Joseph Stieglitz lived, surrounded by their extraordinary Judaica collection. For nearly forty years, one space - the Stieglitz not-particularly-capacious sitting room - had housed the two hundred and eighty objects, placed with great care and thought so as never to appear imposing, but rather to blend perfectly with the life, tempo, and aesthetics of their owners. It was hard to tell where the collection ended and the furnishings of daily life began. The collection was loved by its owners without being worshipped; it was cleaned and dusted but not polished, and it breathed life into its viewers, without taking their breath away. When the room was emptied of its contents, all that remained were the pale squares on the wall, where the ketubbot had hung, the desolate showcases reverberating with their emptiness, the shelves over the terrace door where the Torah crowns had rested looking blankly into the room. Thus the Stieglitz home at 16 George Eliot Street looked once again like any other compact, high-ceilinged apartment in the neighborhood, which was becoming attractive to fashionable young people. It is difficult to gauge precisely the measure of Pnina and Joseph Stieglitz's fortitude in parting without trauma from their collection. Perhaps they take comfort in the conviction that they have made a wise decision, out of the wisdom that comes with age. If they miss the collection, they don't show it. As a grandson of Joseph Stieglitz through my mother, two generations removed from the collection, I hope there is a way of conveying the sacrifice involved in my grandparents' act, as if removing all the sets and props from the stage of this family's life. Under the Gottlieb and amidst many of the objects, we celebrated the festivals. We intoned the Sabbath and festival kiddush and drank the Passover wine out of ancient silver cups, turning the yellowed pages of the rare Haggadah on the table adorned with precious Seder plates. But, say the children, they will always be free to go up to Jerusalem with their grandchildren and great- grandchildren, to the Israel Museum, to show them the collection in its new home, and tell them about Grandfather, and Grandfather's grandfather, about the hardships endured in bringing it to its final home, the trials as well as the joys. This is what even I, the least sentimental of the family, will probably do with my children. All of us want, after all, a spark of immortality, or to be remembered somehow. Unwritten stories tend to fade away, and memories evaporate. I owe it to my grandfather, my children and myself to tell the story of the family collection, now in safekeeping at the Museum. I sense a certain degree of florid phraseology; rhetoric was always the last refuge of the storyteller. With the same astuteness he applied to distinguishing good from bad, the essential from the extraneous, Stieglitz sensed that the storm clouds gathering in the skies of Europe in general, and his native Poland in particular, were heralding not the beneficent autumn rains, but a terrible, black era. In order to avoid being hurled into its vortex, he must escape with his family without delay. "I knew it couldn't end well. I said we must flee. But escaping wasn't so easy..."
In September of 1939, a few days before the German invasion, Stieglitz sent his family ־ parents, wife, three children, sisters - east, from his native Cracow towards Lemberg-Lvov. The men - Stieglitz, his brother-in-law and another relation - joined them three days later. The first day of Rosh Hashanah found them all in a small town in eastern Galicia. In the early days of the war, Stieglitz tried to work in order to feed his family and keep them moving. While he was in Lvov, the entire family was exiled to Siberia . When he returned to join them in the town, he found that he was a lone refugee. With his rational, unemotional approach to life, he didn't try to alter the situation, understand its hidden meanings, indulge in speculation, or ask any questions. He remained in Lvov, an island unto himself, continuing to work while trying to find a way of communicating with his exiled family. "To earn my bread, I went from city to city, buying and selling used furniture and other objects," he said. The world order was crumbling, terror of a magnitude as yet unimaginable was spreading over Europe like a dark blanket. Stieglitz found that earning enough to stay alive had a force and energy of its own. People carried on buying and selling, surviving, behaving as though nothing had happened. Although he was a Zionist, Stieglitz hesitated to emigrate to Palestine: "I was 'first violinist' in the orchestra. When things are going well, a man doesn't think of packing up and moving, especially since the prospects of doing my kind of work in Palestine were nil at the time." The love of Zion was a childhood memory; his father had belonged to the Zionist Mizrachi party and had founded a Zionist synagogue, where the congregation sang the Hebrew national anthem, Hatikvah, after festival prayers. Stieglitz himself had been chairman of the Zionist youth organization in his town. Stieglitz knew that he must adapt himself to the new reality; the good years, 1920-1939, were over. Then, he had been chief supplier of furniture and objets d'art to the royal palace in Cracow, which he filled with fifteenth-and sixteenth-century antiques. In the war years, he "descended," as he put it, from palaces to the battleground of survival. When the family fled Cracow, on that hasty, fateful impulse, Abraham Stieglitz, Joseph's father, had split up his rare and precious Judaica collection, part of which he placed in safekeeping at the royal palace in Szyszko- Bohusz, and another part - dearest to his heart - he packed in his own suitcase and took with him. When he was about to be exiled to Siberia, he left the suitcase with the householder in the family's lodgings. When Joseph Stieglitz returned from Lvov, the householder gave it to him. "It's yours," he said. This symbolic and valuable suitcase runs like a leitmotiv of humanity through Stieglitz's memories of those cursed war years. Twice during that war the so-Jewish suitcase was to be entrusted to gentiles, at a time when gentiles were destroying the Jewish people, and twice it was to be returned to Stieglitz's hands intact, like a kind of symbol of Jewish survival in spite of everything. The first time, the suitcase was handed over to Stieglitz at his father's behest; the second time, when he himself was fleeing from the Germans, he buried the suitcase in the garden of his friend Professor Kulczycki. Even after recounting the story for the hundredth time, Stieglitz's voice is full of emotion over the faithfulness of his friend. After the war, at his request, Prof. Kulczycki and another friend, Prof. Groer, dug up the treasure from the frozen winter earth and sent it to Cracow, where, freed from exile in Siberia, Stieglitz's father waited. Deeply moved, the father offered one of the objects to the professor as a token of his gratitude, but the professor refused to take anything. The keeper of Wawel Palace returned the other half of the collection, making it once again complete. Because after the war the family had all streamed to Palestine, the father, with the help of his friend, the Chairman of the (International) Red Cross, sent the collection to Sweden, whence it was dispatched to Mordecai Narkiss, then director of the Bezalel Museum in Jerusalem. Narkiss transferred the collection to Stieglitz in Tel Aviv, in gratitude for which he was given a Bible book cover of silver, to this day in the Israel Museum. Stieglitz survived the war thanks to his expertise. The Russians needed someone to advise them about all the goods passing through their hands at that time. War days are lively "Market" days. People sell in order to survive, and others buy cheaply. Through his connections with the Russians, Stieglitz tried to find out what had happened to his family in Siberia. His Russian contact warned him against attempting to join them, threatening him with exile -	a fear which drove Stieglitz to sleep in his shop. In the evening his assistant would leave the shop, locking it up with Stieglitz inside. Even in the midst of the war, art objects - carpets, crystal, furniture - were bought and sold. Then, life was pulled along by different gravitational forces. At the Russian stores Stieglitz visited, he met Alexei Tolstoy, the writer, and Sergei Eisenstein, the great Russian film director. They were looking for antiques and fine objets d'art, which for them constituted a kind of excursion into the West. The world was shaking on its foundations, and Tolstoy and Eisenstein wanted art objects. When the family left Siberia the connection was severed. Stieglitz knew no rest. In March of 1942 he reached Budapest, where he remained until 1945. Meanwhile, the family had arrived in Palestine with the immigration of the Teheran children. In 1945 Stieglitz, too, made his way to Palestine via Bucharest, Romania. Ever the pragmatic realist, he immediately set out to find an honorable livelihood. Not daring to hope that he could revert to his first love, dealing in art objects, he was prepared to work as a cabdriver or a carpenter, a trade in which he had formal training. During this period his father went to Poland, where he managed to arrange the transfer of some of the family's money. Stieglitz himself traveled to Poland in 1947 to return with his father, and at the same time he got back some of the objets d'art belonging to him. He opened a shop in Tel Aviv, where he tried to salvage some of the goods, almost totally distinguishing between his unequivocal love and attachment to Judaica, and the existential need to deal in art objects not close to his heart. The old shop on Allenby Street, Tel Aviv, is an auspicious blend of a commercial establishment and a small, European-style museum, a crowded domain over which Stieglitz reigned like a king. Here, various activities were -	and still are - carried on: Grandfather is an acknowledged expert in Jewish art (painting and sculpture) and Judaica. Museums, institutions and collectors seek his advice and opinions on anything to do with Jewish sacred objects. His knowledge in this field stems from first-hand familiarity with Jewish tradition; to this is added the knowledge he has at his fingertips without which such expertise would be impossible. Stieglitz's connoisseurship also embraces plastic art, and it was he who first exposed to Israeli art lovers the works of Jankel Adler, Abraham Mintchine and Maurycy Gottlieb. The main interest of Stieglitz the realist, with the sharp senses, who built beautiful, important collections, is in the nineteenth century: "Modern art doesn't speak to me. I was educated in the Classical." His greatest warmth, zeal and emotion he invested in his personal Judaica collection, based on the family's collection in Cracow, to which were added further pieces over the years. These he did not sell. He was not prepared to part with them, to see them leave his possession. These were the objects that adorned the small space of his apartment, for forty years, on George Eliot Street, once the heart of Tel Aviv. If today he feels the pain of departure of the collection, albeit for the Museum, he doesn't show it. Trade, collecting or museological treatment of this type of art require a special system of sensitivities, spanning two disciplines: the artistic-aesthetic and the cultural-Jewish. Many religious articles have no market price, they are so rare, sometimes being the sole example extant, or of salient Jewish historical significance. This type of Jewish art is believed to have evolved in the thirteenth century. Most Jewish religious articles in collections today date to the era following the Middle Ages. Torah crowns, shields and finials, Torah ark curtains, marriage contracts and rings, kiddush cups, spice boxes and Havdalah accessories, Passover plates and Haggadahs - each comes with its own heart-wrenching story of flowering communities that were destroyed, of family tragedies, a familiar kind of mystery. Here we find collective Jewish culture as well as the works of specific artists, identified by name and professional script. In the 1950s in New York, Stieglitz met someone who told him that a certain Jew, purporting to be a rabbi, had in his possession a unique Torah ark. Information about Jewish art of this type travels routes seldom available to most art dealers. In a small room in the owner's apartment, Stieglitz saw a new Torah ark, but recognized its doors as those of the seventeenth-century Torah ark in the synagogue of his native Cracow - wood carved and decorated with lions, eagles and deer. Somehow the doors had reached New York after the Second World War, an odyssey spanning all the world. As Stieglitz tells it, "It's a tale from the Thousand and One Nights'. I was told that the Torah ark was in the possession of a certain 'rabbi' whose apartment was his 'house of prayer'. I don't know how he got them out of Cracow, and didn't ask. I looked, my heart stopped. After two days of negotiations, I bought the doors. They had to be removed from the Torah ark he had built himself. I suggested he replace them with nice new doors." Stieglitz shipped the doors to Jerusalem, where they are now on exhibit in the Sir Isaac and Lady Wolfson Collection at Heichal Shlomo. In 1955 in Berlin he found thirteen coins with Hebrew inscriptions, dating to twelfth-century Poland, when the king granted the Jews the right to mint their own coins. Stieglitz had known of their existence for many years. The coins are priceless, a sure sign of their rarity. Today, they are in the Kadman Numismatic Museum in Tel Aviv and the Jewish Museum, New York. During a 1961 trip to Poland he bought a seventeenth-century Anatolian carpet with the inscription "This is the gateway to the Lord ־ the righteous shall enter through it." This is one of three; of the other two, one is at the Textile Museum in Washington, D.C. and the other is at the Sir Isaac and Lady Wolfson collection at Heichal Shlomo, Jerusalem, first having been displayed at the Israel Museum. "Jewish Wedding," by the Jewish artist of the Emancipation era, Moritz Oppenheim (1801 1882־), today at the Israel Museum, was purchased by Stieglitz in The Hague in the 1950s. Oppenheim, born in Frankfurt a.M., was known for his paintings of Jewish ceremonial and family life, which serve as valuable historical documentation of his period. Stieglitz shines with an inner radiance when Maurycy Gottlieb is mentioned. This Polish painter died at the age of twenty-three, leaving only a meager legacy. Of all the Jewish artists Stieglitz loves - Ryback, Kisling, Mane Katz, Pascin, the Soyers, Chagall, Jankel Adler, to name a few ־ Gottlieb is the favorite. Perhaps this is because of his early death, his promise as an artist, and the Jewish romanticism of his works. In the movement of his few paintings between Israel and other countries, private collectors and museums, Stieglitz had a significant share. Stieglitz also promoted the works of Leopold Gottlieb, Maurycy's brother, as if he owed the Gottlieb family a favor. Stieglitz's first contact with the Israel Museum came in 1946, when he offered its then director, Mordecai Narkiss, a painting by Gottlieb which his father had purchased in Cracow and shipped to Tel Aviv: "My father bought a small picture by Gottlieb after the war. It was a jewel, in black and white, unsigned, but beautiful. A man came into the shop [Narkiss] and looked at the painting. I could see he was an expert. When he asked the price I told him three hundred pounds sterling. He replied that for such a price he could buy a Matisse. Sometimes I'm a bit cheeky, and after I realized he was the director of the Bezalel Museum, I said, ,Yes, but what would you do with a Matisse in Israel's national museum?' He walked out, offended, thought a while, and came back after an hour and told me he wanted to buy the Gottlieb but had no money. I told him that the price was negotiable." The painting, "Wedding," is now at the Israel Museum, one of many treasures Stieglitz has sold to the Museum, at prices ranging from extremely reasonable to markedly lower than the free market price. The compensation lies partly in the satisfaction of helping enhance his spiritual treasures in the Museum. "Sometimes I feel like a Jewish art hunter, or, sometimes, like one who redeems captives," says Stieglitz. A direct result of this attitude - sober emotionalism - enabled Stieglitz to find a way of transferring his entire private collection to the Israel Museum. Of the special relationship between Stieglitz and the Museum many examples could be cited. "Sometimes I wanted to keep beautiful objects for myself. But when they are rare, maybe twenty people would see them at my home in a year, while at the Museum, tens of thousands see them every year" says Stieglitz. The battle between conscience and inclination, the tug of war between the desire to keep rare treasures and enjoy them in the privacy of his own home, and the sure knowledge that rare Judaica belongs in the Museum, lies at the heart of the decision, finally, to transfer the collection to the public domain - each piece with its story, that of its maker, its wanderings, and its sometimes cryptic inscriptions. "I acquired an Italian amulet in a shape I'd never seen before. I was in Paris when a colleague came from Austria with some artifacts, the amulet among them. I was eager to buy it, but it was not for sale. That afternoon I went to visit another friend, a renowned expert on scientific instruments. A drawer was opened, and there was an amulet that so resembled the one I had seen earlier, I thought it was one and the same. And indeed, it was identical to the one I had wanted to buy, so I bought it instead. The next day I met the colleague with the first amulet, and I took mine out of my pocket and said, 'So this is how you take care of your rare amulet!'" In its new home at the Israel Museum the collection will live a different life, not as a Jewish nature reserve in the heart of a busy Tel Aviv street, but as a permanent museum exhibition whose strength lies in the beauty and emotional content of each of its two hundred and eighty components. On a rational level, there is a certain sense of relief in its transfer to the Museum; no more need to dismantle the collection and store it in the bank vault before every trip abroad, with days spent in packing and storing. It is all easier now, more everyday. Of course, something is missing; but as long as we can find it at the Israel Museum, everyone is the better for it.